Although only 906 of the world’s 40,024 spider species are tarantulas (Family Theraphosidae), these interesting creatures are the best known of the group and among the most sought-after of invertebrate pets. 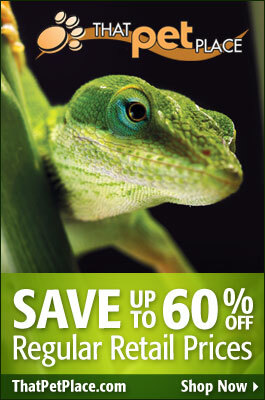 Reptile enthusiasts, myself included, seem particularly drawn to them, hence their inclusion in this blog. Today I would like to provide an overview of the group and specifics concerning some readily available species. Future articles will cover care and breeding in detail. Please Note: Tarantulas, like all spiders, manufacture venom and are capable of delivering a painful bite. Human fatalities from bites are unknown, but their venoms are relatively unstudied, and an allergic reaction is always possible. New World species also possess urticating (irritating) hairs, which are shed when the spider is disturbed. A colleague of mine required surgery to remove hairs shed by a Mexican Red Knee Tarantula (a relatively docile species) from his eye. Do not handle tarantulas, despite what you may see others do – move the spiders, if at all, by urging them into a plastic container, and wear goggles where appropriate. 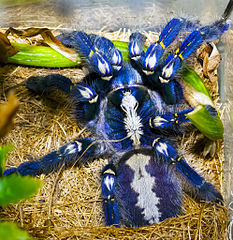 Please also check the legalities of tarantula ownership – several species are protected by law; others are prohibited in some states. Tarantulas range in size from those that mature at 1 inch in length to behemoths with 12 inch leg spans, and may be ground-dwelling, fossorial (burrowing) or arboreal. Females of several species can reach 30 years of age (most males live but 1 or 2 years). They are found in tropical, sub-tropical and (less commonly) temperate regions of Africa, the Middle East, southern Asia, Australia, New Zealand, the Indo-Pacific, Micronesia, Central and South America, the southern half of the USA and throughout the Caribbean. Various species are adapted to live in deserts, open forests, grasslands and rainforests. A number also thrive around people, and may be found in overgrown fields, agricultural areas, gardens and even within homes. Although considered to be “primitive” spiders, tarantulas are quite successful as a group, and are the dominant invertebrate predators in many environments. They take any animal that can be overcome, including spiders, centipedes and other invertebrates as well as snakes, frogs, lizards, mice and other small rodents. The name “bird-eating spider” was first applied to the group in 1705 when Swiss naturalist Maria Sibylla Merian included, in a book on the insects of Suriname, a painting of a pink-toed tarantula consuming a hummingbird. Tarantulas are distinguished from other spiders by their book lungs (unique respiratory organs), the presence of 2 claws and adhesive pads on the tips of the legs and by the fact that they use their fangs in an “up and down” as opposed to “side to side” motion. This rich-brown spider is the undisputed king of the trade and, with a leg-span approaching 12 inches, of the spider world as well. Relatively unknown here until the early 1980’s (please look for my future note concerning my early experiences with them), captive born goliaths are now readily available. This animal is not, however, for the beginner – they are extremely aggressive and fairly demanding as captives. Native to the rainforests of northeastern South America, goliath birdeaters require high humidity in captivity and a terrarium of at least 20 gallons in size. They should be provided with deep, moist substrate in which to burrow, or an artificial cave . Adults are fully capable of overcoming an adult mouse, but such is not recommended as food (dead mice are accepted). They fare well on roaches, earthworms, crickets and wild-caught insects such as grasshoppers and katydids. Quite different from the goliath in color, temperament and captive needs, the red knee is responsible for the advent of tarantula keeping in this country. Jet-black with bright red-orange leg joints, this spider is quite calm in temperament (but can bite and shed urticating hairs, see above) and hardy. One that I received as an adult lived for 18 years, putting its total age at over 23, and similar records are common. The red knee hails from western Mexico, and is tolerant of quite dry conditions (recent hatchlings need a fairly moist environment, however). It does well on a sand-gravel substrate and readily accepts crickets, roaches, newly-molted super mealworms and wild-caught insects. This species is now protected by the Mexican government, but captive-born specimens are commonly available. 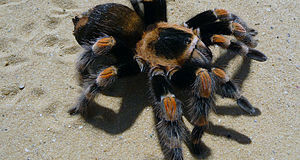 Unlike the previous 2 spiders, the pink-toed tarantula (named for its pink-tipped “toes”, or tarsi) is strictly arboreal. It is also unique in that it is encouraged, rather than displaced, by human activities. Various species range from the Caribbean south to Peru, and readily colonize homes, gardens and parks. Pink-toed tarantulas construct a thick, silken retreat on tree trunks, roof eves and among plants (where they will often bind 2 leaves together to form sturdy walls for their homes). They prefer moderate humidity, but are fairly tolerant in that regard. Oddly for a spider, pink toed tarantulas get along fairly well in groups, with 2-3 individuals usually co-existing in a tank of 20 gallons or so in size. They should be kept in a vertically-oriented terrarium (an aquarium turned on end works well) furnished with cork bark, bamboo and other climbing surfaces. Pink toes relish moths and other wild-caught insects, but also fare well on crickets, roaches and waxworms. This Southeast Asian native is the first of the Old World species that we will cover. Like all, it lacks urticating hairs, but more than compensates for this with its extremely aggressive nature and willingness to bite. They are also quite fast, and should not be handled. Threatened individuals rear up on their back legs to expose the large fangs – which, highlighted against a red-colored patch and often tipped by a drop of venom, are intimidating in the extreme. I have observed several to fall right over onto their backs during the threat display – a position from which, it would seem, an enemy could not approach without being bitten (I have not tried, nor will I!). This species requires a moist substrate into which it can burrow and, being high-strung, does best with minimal disturbance. A night-viewing bulb will enhance your ability to watch the spider go about its nightly activities. Thailand black tarantulas should be fed earthworms, roaches, crickets and wild caught insects such as moths and grasshoppers. 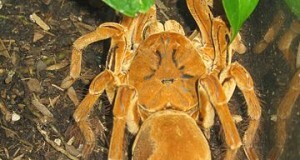 The photo accompanying this article shows a Thailand black tarantula in typical tarantula hunting position – poised at the burrow’s entrance, ready to pounce upon prey or retreat from an enemy. The silk that you see is used to provide stability to the burrow’s walls and most likely alerts the spider, via vibrations, of approaching animals. It is not, and this hold true for all tarantulas, used to ensnare prey. Pingback: Pages tagged "the pink spiders"